Dean Batchelor, in his book The All American Hot Rod, says "First there was George Wight, Then Lee Chapel, then Karl Orr and then everyone got into the act." In 1923 an enterprising character named George Wight established an auto wrecking yard at 3633 East Gage Ave. in the city of Bell near south east Los Angeles. In the twenties half of all the cars on the road were Model T Fords. There were hundreds of companies making accessories and performance parts for the T Ford. George would scavenge these parts from the damaged old cars he would buy for his yard and developed a business refurbishing and reselling early speed parts. It is also important to remember that during this time that stripped down Model Ts were running on dirt tracks all over the Los Angeles area and Legion Ascot Speedway was in its prime, drawing huge crowds, just a few miles north near Alhambra. In 1928 George built the original brick building. 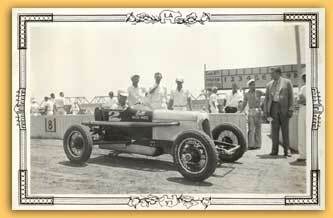 He would sell parts, offer advice, take your race car on consignment and generally entertain the racing community. He sold new and used Miller and Winfield carburetors, along with overhead valve conversions for the new Model A built by George Riley and Crane Gartz (CRAGAR). Crane had purchased the patterns and tooling for the Cragar head from the Miller-Schofield Co. Late in 1932 the Cragar Corporation, Ltd. failed after making a good name for itself in racing. The name might have been lost except for George Wight who made Crane an offer for the patterns and inventory. George was much more than a horse trader. It wasn't long before he had "improved" the Cragar head in to a cross flow design for better breathing. Bell Auto Parts was one of the most important speed shops in the country when the war came and all racing activity was put on hold. George died in 1943 and his widow kept the doors open throughout the war.